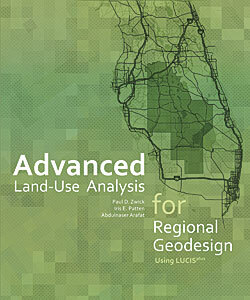 Advanced Land-Use Analysis for Regional Geodesign—Using LUCISplus, a new book published by Esri, is a guide for land-use planners, analysts and advanced GIS students who want to explore a real-world methodology for applying geodesign using Esri's GIS tools. The LUCISplus in the title refers to the inclusion of new automation tools and methodologies for addressing complex planning scenarios that include factors such as affordable housing and transportation planning. LUCISplus analysis tools are powered by Esri's geoprocessing framework and make extensive use of ModelBuilder.